In 1965, Gordon E Moore, cofounder of Intel Corporation, stated that the number of transistors per square inch on integrated circuits (also called chip or microchip) had doubled every year since it was invented. The simplified version of this law states that the overall processing power of computers doubles every 2 years. This advancement in the microchip is not restricted to computers. It spills over to all other areas including pediatric cardiology. The diagnostic tools that we use today including the simple chest X-ray, echocardiography, cardiac catheterization, computed tomography, or magnetic resonance imaging; all use this technological advancement to provide better results. The same applies to almost all equipment we use in the operating room, catheterization laboratory, or in the intensive care unit (ICU). However, this advancement of technology comes at a cost. Research and development, manufacturing, and testing costs have increased exponentially with each new generation of equipment. A Dabbawala is a person who is a part of a delivery system that collects hot food in lunch boxes (also called Tiffins) from the homes of working people and delivers it to their workplaces, most commonly in Mumbai. These Tiffins go through different modes of transport, mainly bicycles and trains; pass from person-to-person and reach their destination in time. Approximately 175,000 Tiffin boxes are delivered and returned each day by mostly illiterate and unsophisticated group of people with an error occurring once in 16million deliveries. They use a few simple numbers and symbols to indicate the pickup, railway stations of origin and destination, and the delivery address. The commitment of these Dabbawalas to their job and the simple system which can be understood by these mostly illiterate people is probably the secret of their success. They provide a simple, efficient, and fool-proof service with an error rate that we in medical practice cannot dream of, at a cost of few hundred rupees a month which most of the working people in Mumbai can afford. Pediatric cardiologists in low- and middle-income countries (LMIC) have to decide between these two paths in their day-to-day practice. Every day there is advancement in technology including its price tag, available for diagnosis and treatment of heart diseases in children. However, the majority of people in developing countries cannot afford these services with their day-to-day income. They have to either sell or pawn their jewelry or property which they have inherited, to receive treatment for their child. Moreover, this technology is brought into the country mostly by the private sector hospitals. Most of them are not charitable or not-for-profit organizations, but are the medical arms of business conglomerates. They have their own profit targets. Better the profits, happier the management, and more the bonuses that staff gets. get this amount from the money an average citizen pays for the treatment of his/her child. He does so by selling his property. Is this development justified? How does it apply to Sri Lanka? What are the challenges that we have faced in developing a sophisticated field in a developing country? How do we move forward to provide a good quality service to all those who need it? Sri Lanka is unique in many ways. The country is small (65,000 km 2 ) with a population of 21million. Most of the health indices like infant mortality rate (8 per 1,000), maternal mortality rate (29 per 100,000), and life expectancy at birth (male 71 years and female 78 years) are the best in the region. It has a high literacy rate (91.2%). All these are strengths that we have when starting a pediatric cardiac program. Our percapita gross domestic product (GDP) is 3,279 USD (in 2013) and per capita annual expenditure on health is 89 USD (in 2012). Total expenditure on health is 3.2% of the GDP. Sri Lanka is one of the few developing countries in the world that provides total free healthcare for all. This includes not only low cost medical treatment for common illnesses, but also high cost treatment like pediatric cardiac interventions and surgery. There are private sector hospitals, but when it comes to high cost treatment, especially in children, parents seek treatment from government hospitals. Development of pediatric cardiology in Sri Lanka did not happen overnight. In 1972, the Cardiology Unit at the National Hospital was commissioned and was the sole referral center for adult and pediatric cardiac patients. Establishment of a dedicated pediatric cardiology unit at Lady Ridgeway Hospital for Children (LRH), Colombo in 1998 was a major breakthrough in the development of care for children with heart disease in Sri Lanka. The unit was established with the appointment of Dr S. Narenthiran, a consultant cardiologist with special interest in pediatric cardiology. There was only a medical officer, a nurse, and an attendant with a small room and one echocardiography machine. A 24-bedded ward for inward patients was added in 2002 and the catheterization laboratory was commissioned in 2005. However, the real birth of pediatric cardiac services happened when the two cardiac operating theaters and the six-bedded ICU was commissioned in 2007. Another 12-bedded ICU was added in 2010 as it was apparent that the number of ICU beds was the bottleneck in expanding surgery. The expansion is not yet complete as we can cater for only 50-60% of the country's need. Manpower expansion paralleled infrastructure development. Pediatric cardiology was introduced as a separate specialty in 2004. It was a 4-year training program with 2years of local training and 2years of overseas training. Being a superspecialty, only those who had completed a 3-year course of Doctor of Medicine (MD) in general pediatrics could apply. The first pediatric cardiologist was appointed in 2008 to LRH and since then there was a smooth transition from adult to pediatric cardiologists. The first cardiac anesthesiologist was appointed in 2002 along with a cardiothoracic surgeon. Currently the center is manned by three pediatric cardiologists, three cardiac anesthesiologists, and three cardiothoracic surgeons. In addition to LRH there are four pediatric cardiologists working in four other centers, namely Jaffna, Kandy, Kurunegala, and Galle. Even though there are cardiothoracic units at four other major government hospitals, since the inception of the Cardiothoracic Unit at LRH, their focus has shifted towards coronary artery disorders, leaving almost all children with congenital heart disease (CHD) to be treated at LRH. Since its inception, the pediatric cardiac services have rapidly grown over a very short period of time. Being the only tertiary care referral center for the country, almost all patients with significant cardiac lesions are referred to LRH. We perform approximately 25,000 echocardiograms every year and of this approximately 10,000 are new referrals. We perform evaluation of first visit patients on the same day of referral, as there is a chance that they might not come back due to financial constraints if we give them another date for evaluation. Most of these referrals are due to benign murmurs and abnormalities are detected only in less than 30%. The positive aspect of this low threshold is that we rarely have children with significant lesions presenting late. For example we rarely have a transposition of great arteries (TGA) presenting after 1 month. However, the low threshold leads to overcrowding of outpatient clinics. The Cardiac Catheterization Laboratory at LRH was the first in Sri Lanka which was open for emergencies 24 hours a day, 365 days a year and is the only dedicated pediatric cardiac catheterization laboratory in the country. We perform 4 to 10 cardiac catheterizations every day and a total of approximately 1,000 cardiac catheterizations every year now [Figure 1]. Almost all cases are done under ketamine anesthesia without endotracheal intubation. Therefore, we can perform more cases in one day as time taken for induction and recovery is much less. Even though LRH is a dedicated children's hospital, 8% of cases performed were more than 12 years of age. During the initial period most of the catheterizations were interventional procedures. But now, after clearing the backlog and with more and more complex cases being operated, most of the procedures are diagnostic. The waiting time for elective catheterizations is 1-2months. Device closure of atrial septal defect (ASD) was the commonest catheter intervention performed in our catheterization laboratory. From December 2005 to June 2013, a total of 1,716 patients underwent device closure of ASD. Eighty-five percent patients were between 4 and 12 years of age and 65% were female. Devices from five different manufacturers: Amplatzer (St. Jude Medical, Minneapolis, USA), Blockaid (Shanghai Shape Memory Alloy Company, China), Cardiofix (Starway Medical Technology, Inc., China), Cocoon (Vascular Innovations, Inc., Thailand), and Lifetech (Lifetech Medical, Shenzhen China) were used with similar results. The procedure was successful in 1,612 (94%), unsuccessful in 95 (5.5%), and abandoned in nine (0.5%). Success rate of ASD closure has significantly improved from 75% during the initial 3 years to 97% during the last 3years (chi-square 37.1, degrees of freedom (df) = 1, P < 0.001). 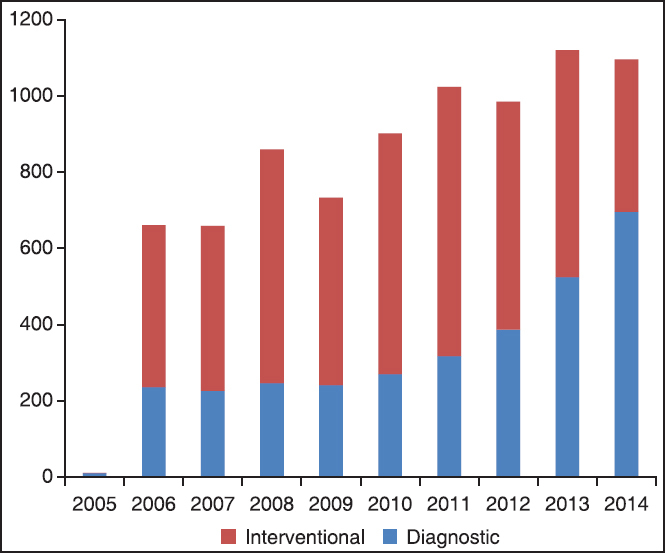 Mean fluoroscopy time has significantly dropped from 16.2 min in 2006 to 4.1 min in 2013. Device embolization occurred in eight (0.46%) and all were within 24 h of implantation. One patient died due to cardiac perforation and four (0.23%) patients developed complete heart block after device closure. There were no cases of endocarditis or bacteremia after the procedure. Other commonly performed interventions include patent ductus arteriosus (PDA) closure, balloon pulmonary valvotomy, balloon angioplasty of coarctation of aorta, balloon aortic valvotomy, and balloon atrial septostomy. Less commonly performed procedures include device closure of aortopulmonary window, pulmonary valve perforation and valvotomy for pulmonary atresia, coronary arteriovenous fistula closure, PDA stenting, coil closure of pulmonary AV fistula, closure of systemic to pulmonary fistula, and hybrid closure of muscular ventricular septal defects. Complications in cardiac catheterization are very rare. They range from a simple hematoma at the puncture site to death on the table due to cardiac perforation. We have analyzed our major complication rate from December 2005 to June 2013. Total number of patients was 6,300. Our major complication rate, where there was either loss of life, significant life-threatening event, or permanent disability as a complication of the procedure, was 1.36% in 2006 and has remained less than 0.3% from 2009 to 2013. There were 17 deaths (0.27%) during the study period, but only three (0.05%) were a direct consequence of the procedure. There was a statistically significant difference in mortality rate between initial 2 years (0.76%) and last 2 years (0.05%) (chi-square 7.9, df = 1, P = 0.004). There were no cases of bacteremia or endocarditis following cardiac catheterization during the whole study period. The number of cardiac surgeries performed at LRH has rapidly increased from 273 cases in 2007 to 1,013 cases in 2014 [Figure 2]. The success of a program is not measured by the number of surgical procedures alone. It involves case mix, age and weight of patients operated, and mortality rates as well. Case mix ranged from simple ASDs to more complex cases like TGA and univentricular repairs. 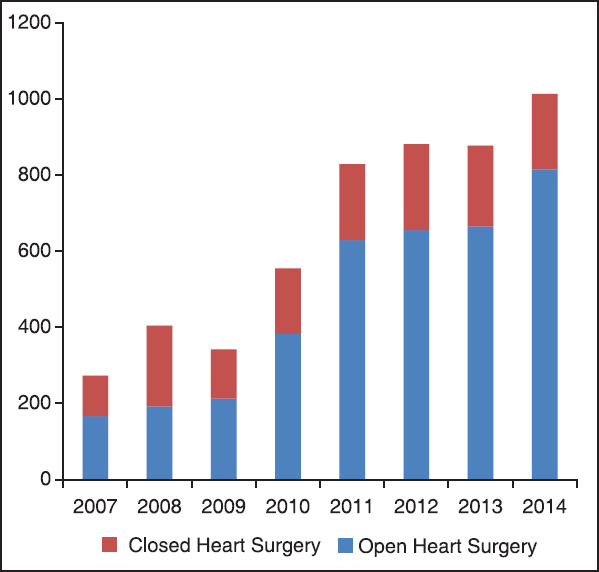 The mortality rate from January 2012 to May 2013 (n = 1,300) was analyzed and it showed that the overall mortality rate was 6.38% with 6.48% for open heart surgical procedures and 6.12% for closed heart surgical procedures. A clear majority of operations were done on children less than 1 year of age with a weight less than 10 kg. All newborn surgical procedures like correction of TGA and total anomalous pulmonary venous drainage are done during the neonatal period. Currently, we do not perform surgery on hypoplastic left heart syndrome due to need for multiple surgeries and prolonged ICU stay with a poorer outcome. There is no use in having the best pediatric cardiac program if most of the people in that country cannot afford it. When a significant number of adults with coronary artery diseases go to the private sector for treatment, why do children with CHD come to the government sector? This is mainly because CHD is diagnosed early in life and the parents are young and have just started to earn. They have spent most of their savings on the wedding, antenatal care, and delivery. When a cardiac lesion is diagnosed in the newborn, they do not have any financial reserves to spend on surgery or intervention in the private sector. If they are asked to find money for the surgery, by the time they get money, either the child has died or has become inoperable. Moreover, congenital heart lesions are not covered under insurance. Therefore, if we are to develop a sustainable pediatric cardiac program in a developing country like ours, to offer treatment to those who really need it, the best option is to initiate it in the government sector. One of the main determining factors of progress and viability of a pediatric cardiac program is the influence during the learning curve. The reason for establishing an efficient system, especially in cardiac catheter interventions in Sri Lanka, is the initial influence that we had from India. During the early part of this millennium, Indian experts like Dr R Krishna Kumar visited Sri Lanka to conduct training workshops on interventional procedures. We learnt cost effective strategies and established them as standard operating procedures (SOPs). Device closure of ASDs under ketamine and use of multiple coils for closure of large PDAs are two examples. By avoiding balloon sizing of ASDs, we could significantly shorten our procedure time to approximately 30min. However, analysis shows that this did not add any risk to the patient as our device dislodgment rate was very low (one in last 1,000 cases) and we did not have any erosions due to devices. Some other countries in the same region and same economic status perform the same procedure under general anesthesia and intubation with balloon sizing taking 1-2 h for the procedure purely due to the influence they had during the initial learning curve. This shows that a country adopts a system not on economic status, but on the initial influence. It is very unlikely that these SOPs will change over time unless there is a significant outcome difference. Planning a service has to be scientific and based on data. Availability of data is a major issue in this part of the world as we rarely enter data into proper databases. However, at LRH we have data from the first case onwards on procedures performed in the cardiac catheterization laboratory. These were then upgraded to Access databases and expanded to other areas like outpatient clinics, inward patients, cardiac surgery, and cardiac intensive care. Today most of the data in cardiology, cardiothoracic surgery, and cardiac intensive care are recorded in databases. All these databases were made using a simple platform, Microsoft Access, and serve the purpose. The purpose of these databases is not only to collect data but also to issue discharge summaries, plan procedures, and organize work in order to be more efficient in a limited resource environment. Collection of data right from the beginning will also show the strengths and weaknesses and will help to plan the end. These three examples clearly show how the beginning could affect the end. Infrastructure development, manpower, and consumables are the challenges in any pediatric cardiac program. At the moment we perform 25,000 echocardiograms; 1,000 cardiac catheterizations; 1,000 pediatric cardiac surgeries with three consultant cardiologists; three cardiothoracic surgeons; and three anesthesiologists. There are no intermediate category doctors or trainees in any of the three fields and the next level is medical officers with a basic Bachelor of Medicine, Bachelor of Surgery (MBBS) degree. We only have 60% of the nursing officers needed for the ICUs. We have one catheterization laboratory, two operating rooms, and 18 ICU beds. All these show that we are overworked and overcrowded. A ready supply of consumables is a major issue. With government procurement procedures we need to forecast and purchase in bulk. How can we forecast precisely the sizes of ASD devices that we will be using over next year? Invariably there is wastage and supply of low quality consumables. Equipment is no exception. Improper expansion of services and maldistribution of manpower is a major issue. Medical officers are transferred to keep the transfer process active without considering the service need. Cardiothoracic surgeons are appointed to hospitals without cardiac theaters. Decisions on expansion are made without exploring the need or conducting feasibility studies. Under these circumstances, in a developing country with limited resources, how do we proceed to provide care for all children with heart diseases, in a timely and appropriate manner? Infrastructure, manpower, and consumables are the three lanes that need to run in parallel. The first is to improve the infrastructure facilities for cardiac surgery. We have already laid plans to increase the number of theaters from two to four and the number of ICU beds from 18 to 40. To address the manpower issues, Pediatric Cardiothoracic Surgery and Pediatric Cardiac Intensive Care need to be introduced as separate subspecialties. An intermediate category between consultants and medical officers needs to be identified. Recruitment of nurses and providing them with specialized training in cardiac care is another main proposal in the pipeline. Once the infrastructure is completed, the support of visiting teams can be obtained as an interim measure to cover the deficit, until we reach our full strength with local manpower. The government is bound to provide consumables but to ease the burden we need to get donations from well-wishers, charity organizations and few of those patients who can afford. Establishment of a tissue bank to provide homografts, which is a low cost and better alternative to conduits, has already been initiated with the help of Rotary International. Developing a high cost and high tech specialty in a resource-limited environment is not an easy task. We have to choose between Moore's cutting edge technology with its price tag and low cost Dabbawala technology which can be afforded by most. The best option perhaps lies in frugal innovations where cutting edge technology is available without frills, to the developing world at a reasonable price. "Give us a phone with a dual core processor, 720 × 1,280 pixel display and a 5 MP camera instead of a one with an octa core processor, 1,440 × 2,560 pixel display and 40 MP camera" should be the request that pediatric cardiologists in developing countries make when it comes to technology and equipment. It is simply because you can buy the first at one-fifth of the cost of the second and there is hardly any difference between the two in standard day-to-day use. If we in low- and middle-income countries, where most of the world's population lives, get together and insist on frugal innovations from the same companies that provide the cutting edge technology, we will be able to develop sustainable and affordable pediatric cardiac programs. This is the way forward in providing good quality outcomes at an affordable cost with the greatest potential to reach the average child in the planet. Brock DC, Moore GE, Understanding Moore′s law: Four decades of innovation. David C. Brock, 1 st ed. Philadelphia: Chemical Heritage Foundation 2006. p. 122. Chakravarty SN. Fast Food. Available from: http://www.forbes.com/global/1998/0810/0109078a.html [Last accessed on 2015 Mar 11]. Unicef Statistics Sri Lanka. Available from: http://www.unicef.org/infobycountry/sri_lanka_statistics.html [Last accessed on 2015 Mar 11]. Health expenditure per capita. Available from: http://data.worldbank.org/indicator/SH.XPD.PCAP/countries [Last accessed on 2015 Mar 11]. Samarasinghe D, Narenthiran S, Santharaj W, Morawakkorala R, Perera S. Successes failures and complications of ASD device closure; A single centre experience over a period of eight years, in The 5 th Congress of the Asia-Pacific pediatric cardiac society. Ann Paediatr Cardiol 2014;29. Samarasinghe D. Paediatric Cardiology in Sri Lanka: Yesterday, today and tomorrow. Sri Lanka J Child Health 2014;43:3-19. Welke KF, O′Brien SM, Peterson ED, Ungerleider RM, Jacobs ML, Jacobs JP. The complex relationship between pediatric cardiac surgical case volumes and mortality rates in a national clinical database. J Thorac Cardiovasc Surg 2009;137:1133-40.